What existing molds would you like to see in a color of your choice? I'd like to see a pink/purple Callgrim. Maybe an Ultimate or Standard Sentinel. 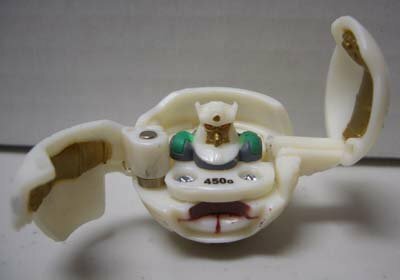 Re: If you could any part, figure, or set of parts in any color, what would it be? I'd like to see a color like Ivorium, but instead of a finish, it be pearlized into a metallic. Especially a Kabuto Mushi. I Love metallic Mushis. Also callgrim in these recent "power ranger" metals we have gotten. I freakin' love metallic glyos. Still waiting for a Spectre Core Block, and it sounds like I may wait forever. I'd also like a Spectre Banitank. Artic_ wrote: I'd like to see a color like Ivorium, but instead of a finish, it be pearlized into a metallic. There was a pearl colored mushi, the galactic emperor mushi was pearl off white w/ purple & there was an unpainted pearl off white too. I'd love to see Rothan or Destoyator colors make a comeback especially for traverlers, crayboth & mushi's. 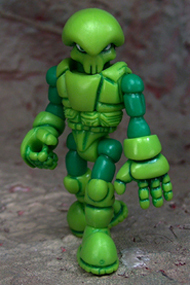 Robo Force and/or zeroid kit in solid green. Fuzz wrote: Robo Force and/or zeroid kit in solid green. Bravecarrot22 wrote: Which shade of green? For me, an Armorvor in the Rider Mushi emerald metallic green. Now that would kill!!! Metallic/Pearl orange anything mixed with metallic/pearl black anything. Also casting my vote for a solid yellow-green or grass green. One of the few 'standard' colors that has not been rolled out over an entire drop. I'm with Gabe, Rothan FTW!! Yeah, I've always been looking for a nice vivid green in my Glyos figures, Onell especially, and it always seems to slant to the aqua or military green. I've got a Remnant Pheyden that's a really nice shade of green that's never been reused, that with a bit of metallic shine would look amazing. Crystal clear with GITD detail lines so when in dark, the glow shines through the clear body. Anything in the new Aginnex colourway that appeared on the crays in the latest drop. I can't get over how great the neon yellow and purple look together. A Pheyden or Buildman in those colours would look great. Would like to see a jet pack or metallic wings for travelers. Mutt12 wrote: Would like to see a jet pack or metallic wings for travelers. You can make multiple variations of jetpacks using a Callgrim warp pack available in the Callgrim shop for $4 ea. Solaris Armorvor Core, switch pins, and vinyl switch pins would be great, filling in ports with bright glowing red bits. Hades Heavy Rig and Rig Runner, EMD Armodoc for that Vinyl fill. Wheels in a perfect clear would also be great, but that's a long shot. The giant Gobon waist in a ton of different clear colors would be amazing for display bases and giant builds. What if we could get a set of Gendrones in construction colors? Like, we could have one or two yellow colors, with maybe a dark brown-black metallic "highlight" (such as the silver paint on the Gendrone Alliance release this September), and some yellow-and-black warning stripes as tampos? One of the Gendrone trio could be red instead, as there's always that one red pick-up at job sites (maybe Argen, as he is sort-of the "supervisor" of the group). Heck, if we ever could get tampos on Swing Joints, even, it could make for a Contained Build Phaseon or Accessory Set build homage to the Power Loader. Any other "thematic" ideas out there? kranix wrote: What if we could get a set of Gendrones in construction colors? Like, we could have one or two yellow colors, with maybe a dark brown-black metallic "highlight" (such as the silver paint on the Gendrone Alliance release this September), and some yellow-and-black warning stripes as tampos? Looks like the next round of Bio-Mass might be all homages, with the Dcon My Pet Bio-Mass, hmm, very cool! Looking good! I would also be in for some construction-themed figures. Even police and rescue colors would be cool. Wow. That thing is nuts! akum6n wrote: Looking good! I would also be in for some construction-themed figures. Even police and rescue colors would be cool. Especially if we see apps like the beastie above. Glyan PD (with an Astroloc Combo Buggy cruiser), Ladder-bot Phaseon, and Gobon-ulance decos? I'd be down.